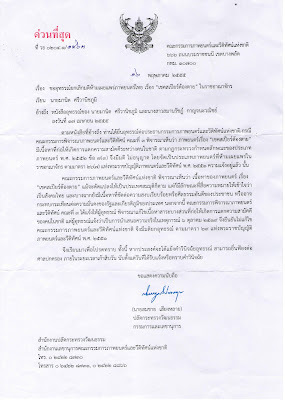 According to the above document, you have filed an appeal to the National Board of Film and Video regarding the Film and Video Censorship Committee (3rd Committee)’s deliberation that the film ‘Shakespeare Must Die’ has content that causes disunity among the people of the nation, according to ministerial regulations describing types of motion pictures, 2009, Article 7(3), which led to their verdict to withhold permission, thereby classifying the film as among films forbidden to be distributed in the Kingdom, according to Article 26(7) of the Royal Edict on Film and Video, 2007, as declared. 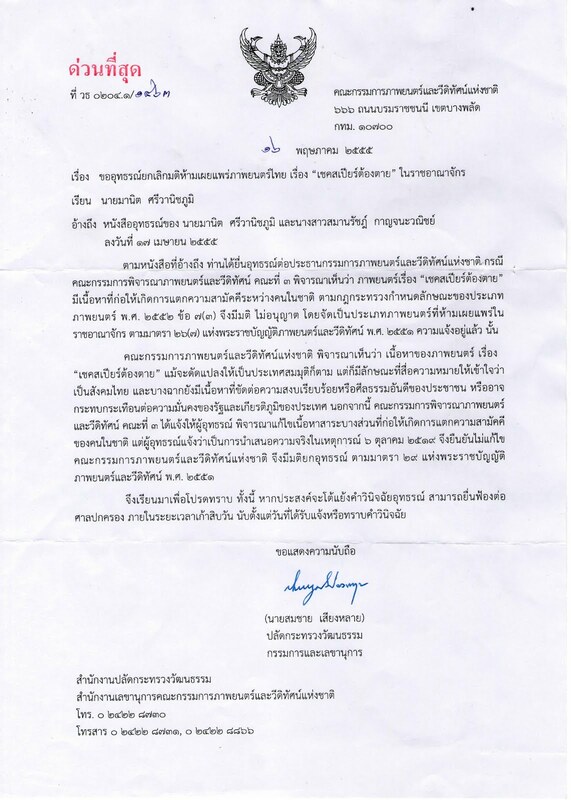 The National Board of Film and Video finds that content of the film ‘Shakespeare Must Die’, despite having been adapted to a fictitious country, has many signifying characteristics that imply Thai society. Further, some scenes have contents that are in conflict with public peace and order and good morality among the people, or may adversely affect the security of the state and the patriotic dignity of the nation. Furthermore, the Film and Video Censorship Committee (3rd Committee) had told the complainant to consider correcting parts of the content that causes disunity among the people of the nation, but the complainants declared that they are presenting the truth of the events of October 6, 1976, and confirmed their refusal to make corrections. Hence the National Board of Film and Video has passed the verdict to reject the appeal, according to Article 29 of the Royal Edict on Film and Video, 2008. Please be informed accordingly. However, if you intend to object to the verdict on the appeal, you may file your case with the Administrative Court within ninety days, counting as day one the day you receive this verdict or the news thereof.